RfLapCounter is a complete timing system for RC cars that allows sessions or races/rallies organisation. It is intended for outdoor and works on all track conditions (dusty, muddy or sandy) and in every kind of weather (sunny or rainy). This kit has been designed for training and unofficial races. It is not compatible with the AMB/MyLaps chronometer or the I.R. system. Operating mode : When the car crosses the detection rod, the transponder sends a RF signal to the decoder located on the edge of the track. The lap time is then transmitted to the software (PC) or application (Smartphone). Several 'USB' or 'Bluetooth' decoders can be used simultaneously with a single detection rod. - 1 detection rod covering the track width (from 60cm=2feet to 5m40=17.7feet). - 1 transponder per car. - 1 decoder 'USB' connected to a PC equiped with a software from our range, or . . .
1 decoder 'Bluetooth' connected to a smartphone equiped with our android application. - The transponder is mounted on its support with the help of a nylon cable tie; no electrical connection is needed. - Concerning the receiver part, the detection rod is placed on the ground and the decoder is connected to a PC or a smartphone. - The decoder 'RC2 USB' works connected to a computer by the USB port. - The decoder 'RC2 Bluetooth' works connected to a Smartphone (or a PC) by Bluetooth link. 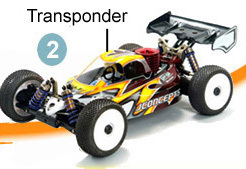 - The transponders are completely waterproof; they work even in dusty or muddy conditions. - The detection rod, once covered with its special hose, can be left permanently on the track. - Our PC software offers a wide range of utilisations like the realization of training sessions or the management of races/rallies. - Our free Android application allows the drivers to do timing sessions with their smartphone. - More than 65000 codes are available (each transponder is unique). - With our PC software, the system can manage up to 20 cars simultaneously. With our smartphone application, 10 cars can be timed simultaneously. - The resolution time is 1/1000th of a second. The accuracy on the lap time is +/- 0.002sec with our decoders 'RC2'. - The kit is available as from 185euros (detection rod for 1.20m track = 4feet, decoder 'RC2 USB', 1 transponder, software 'Rf LapC Basic timing'). - A competitive equipment costs 317euros (detection rod for 3m60 track = 12feet, decoder 'RC2 USB', 1 transponder, software 'Basic timing').